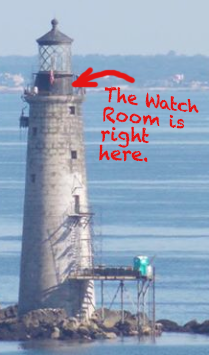 The Watch Room at Graves Light, before initial cleaning and painting (left) and after sandblasting and first coats of primer and paint (right). Here’s the first look inside Graves Light after our initial cleaning and preservation. These two pictures are of the Watch Room, the black metal deck on top of the granite tower, just beneath the bronze-and-glass lamp room (see illustration). The outer walls are 1/2″ thick brass or bronze. The inner walls are thin sheets of steel. We had everything sandblasted. All brass, which had been painted, was coated with a clear preservative to keep the golden color of the metal. The two doors and doorframe at left, which lead out to the watch deck, are bronze. So is the circular perimeter of the ceiling where the round skylights can be seen. The center of the ceiling is a modern addition from when the Coast Guard removed the enormous, original first order Fresnel lens and installed an automated system. We primed the cast iron stairway and steel interior walls, repaired rusted sections, and painted the walls white and the stairs black with a special marine epoxy paint. Because this room had no windows and little ventilation, we cut large holes through the walls and installed antique brass portholes from a steamship that sailed at around the time Graves Light was built. We have a long way to go on this room, as it is going to be a kitchen and social area. This is just the first look. Tagged brass, bronze, sandblasting, watch room. requesting email updates for my hubby who painted there last sunday. thanks! !